In 1964 Mikoyan Design Bureau designed interceptor MiG-25P («Foxbat A») and photo reconnaissance MiG-25R («Foxbat B») which both had outstanding performance data. Designers used a lot of original technical decisions, for example stainless steel airframe skin usage instead of aluminium alloys, welding instead of traditional rivets and neat alcohol usage for aircraft systems cooling. Record-breaking variant E-266 established 29 world records, many of them were in force for more than 10 years. High speeds and altitudes available for MiG-25 gave to Air Force Command idea to develop reconnaissance-striking variant MiG-25RB because there did not exist such air-defence system capable to intercept this «Steel Bird». Equipment which was installed on MiG-25RB allowed to perform strikes with up to 500 kg caliber conventional bombs. MiG-25RB production started in 1970 at Gorky (Nizhniy Novgorod nowadays) Aviation Plant and aircraft equipment continuously improved. In 1973 was made new variant MiG-25RBS which carried side-looking radar «Sablya» («Sabre»). This radar allowed to make terrain and objects' pictures with quality comparable to photography. Taking into account that aircraft has to fly over or close to target to make photos, new radar allowed MiG-25RBS to remain on imposing distance from the target and not to fly into the air-defence zone. That's why cameras were not installed on this variant, instead of them MiG-25RBS was equipped with radar-jamming system SPS-142 «Syren» («Lilac»). Since 1981 part of the produced MiG-25RBS' were upgraded with more modern and sophisticated radar «Shompol» («Ramrod») and received new designation MiG-25RBSh. In 1980's one MiG-25RBS received air-to-air refuelling kit for evaluation and to clarify flight characteristics. Mass MiG-25RBS production continued till 1977 and in general 220 MiG-25RB and it's variants were manufactured till production was suspended in 1982. MiG-25RB received order for battle at once with test trials completion. In 1971 two MiG-25R and two MiG-25RB were relocated to Egyptian Cairo-West airforce base. Was formed special 63rd Separated Aviation Detachment under Col. A. Bezhevets command. Till July 1972 this Detachment made several flights over Egypt and Israel. All Israeli Air Force efforts to intercept MiG's using «Mirage» III and F-4E «Phantom» fighters and «Hawk» air-defence missiles failed. Photos taken by MiG's covered almost the whole Israeli territory and been used for planning «Yom Kippur» war which started on October 6th, 1973. During this conflict another group of four MiG-25RB's was sent to Egypt and provided military command with important information from battle area. During one of these flights two MiG's were intercepted by Israeli «Phantoms» but all fired missiles could not pursue whisking «Foxbats» and self-destructed far behind them. Occasionally MiG-25RB's were used during Soviet-Afghan War. In 1980 one small group performed high-altitude photo-recce flights over Afghanistan territory. Russia Air Force utilized MiG's over Chechnya since 1994 till 2000. Reconnaissance variants were exported together with interceptors. Algeria bought in general 24 MiG-25's and used them actively in 1980's during the war in Western Sahara and also uses them nowadays against local Islamic extremists. 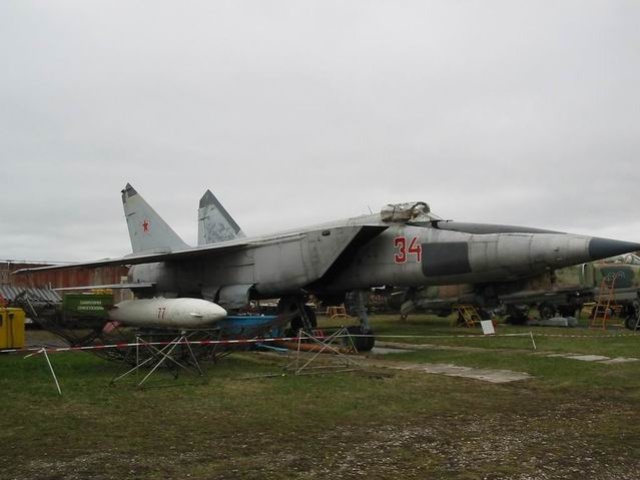 Bulgaria widely used it's three MiG-25RB's till 1991 and provided intelligence data for all Warsaw Pact countries. India imported six MiG-25RB's and used them during long-lasted conflict with Pakistan. Iraqi «Foxbats» took part in three wars and finished their career in 2003. During Iran-Iraqi War (1980-1988) eight MiG-25RB's performed not only reconnaissance flights but also struck various targets in enemy hinterland. For example, successfully struck oil rigs and terminals in Persian Gulf and bombed airbases in Tehran area. Iraqis lost two MiG-25's during this war (first was lost in 1985 due to engine disintegration and second in 1987 on landing). None MiG-25RB was lost in battle. Libya was the largest MiG-25 customer with 80 aircraft in record. MiG-25RB's made successful flights during war with Chad. Syria utilized it's «Foxbats» in Arab-Israeli conflicts during 1980's. After Soviet Union collapse Azerbaijan received 15 MiG-25-recce and unsuccessfully tried to use them during the conflict with Armenia, loosing one aircraft. Our Museum has MiG-25RBS serialled 34-red (production number 0200004) and was donated by former Riga Military Aviation Engineers High School.